Does the thought of implementing new software make your IT team cringe? Well, we have some great news for you! 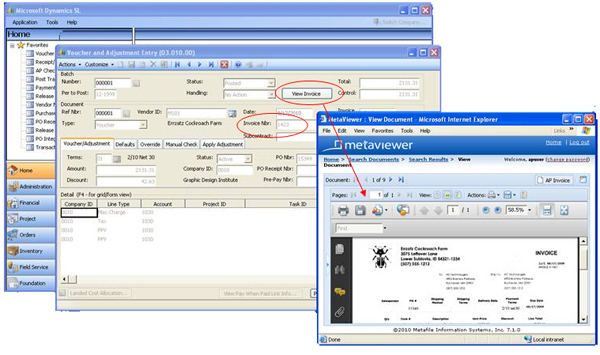 MetaViewer Paperless Automation is available in a number of implementation strategies including MetaViewer Online, MetaViewer Subscription on Premise and MetaViewer Licensed Software. The full power of MetaViewer's paperless workflow is available to you in the cloud as a monthly subscription using the MetaViewer hosted option. This means paperless automation for your accounts payable, accounts receivable and human resources departments is more efficient than ever before, and with even fewer IT resources needed! Hosted in a secure, world-class data center, MetaViewer in the Cloud links all documents to your other business applications. And because it’s a remotely hosted application, all software and documents are housed securely offsite—enabling web-based, paperless ERP and allowing you to capture, manage and access your content without the expense of internal infrastructure and software licenses. You purchase the solution, MetaViewer experts provide the implementation and ongoing services and enhancements for a painless transition to the benefits of paperless automation. The comfort of a traditional software installation and the excitement of a new, state-of-the-art document management solution.